Rebuilding Place in the Urban Space: Instead of a third Chesapeake Bay Bridge, why not start out with a fast ferry from Rock Hall to Baltimore? Instead of a third Chesapeake Bay Bridge, why not start out with a fast ferry from Rock Hall to Baltimore? Image from "Letter to Editor: Northern Bay Bridge Through Kent County Is Not a Viable Solution," Chestertown Spy. 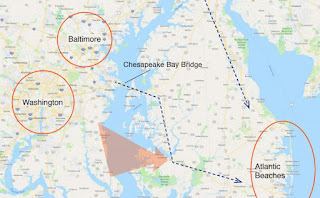 In response to the article a couple days ago in the Washington Post, "Hope and opposition emerge as Maryland scouts locations for a new Chesapeake Bay Bridge," discussing the possibility of a third Bay Bridge, which could cost $7 billion or more, this suggestion came up in a private email thread. The commenter chooses to remain anonymous. Note that the Wilmington News-Journal and Baltimore Sun have been covering this issue for awhile. Ferries in Washington (and Baltimore). Before the development of integrated freeway networks, steamboats provided transportation within the Chesapeake Bay between Baltimore, Norfolk, and DC and within the Mid-Atlantic. I've lived in the DC area since 1987 and I can remember back to at least 1992 proposals for ferries on the Potomac River, paralleling the I-95 corridor. The studies keep coming ("Fast ferry service in D.C. region possible in near future" and "Regional fast ferry concept moves forward," WTOP radio). The problem with the concept is while the river seems so attractive a route, the problem is getting to it. The distances to get from a rider's origin point to a river side pier and at the destination, from a river side embarkation point to the final destination, are considerable. 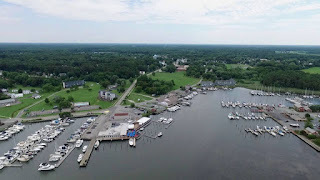 Not to mention where you can have docks south of Alexandria may or may not be good places to capture enough potential riders. Thus ferries don't seem all that practical a commuter mode in the DC area. DC area water taxis. 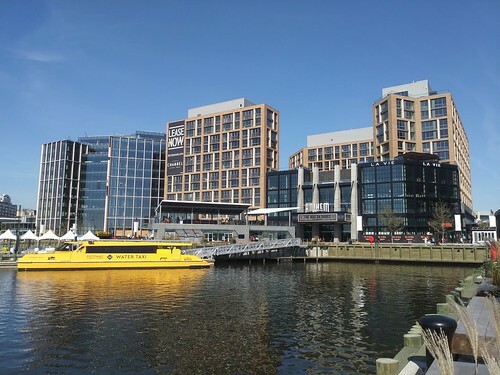 That being said there have been various water taxi type programs between Alexandria, National Harbor (in Prince George's County), and the Southwest Waterfront. The opening of the Wharf District ("District Wharf embraces DC’s waterfront," Charleston Gazette-Mail) is associated with a big expansion of water taxi services ("The Wharf water taxi service to National Harbor starts," WTOP radio), although I am still doubtful there is much in the way of commuter transportation potential for the service. Potomac Riverboat Company, acquired by Chicago-based Entertainment Cruises in 2016, operates four water taxis from The Wharf, each with a capacity of 150 passengers. Water taxi rates start from $20 round trip, with season passes priced at $175 aimed more at commuters than recreational passengers. The new Baltimore water taxi on the water. (Photo by Stephen Babcock). Baltimore already has an extensive, tourist oriented water taxi system. 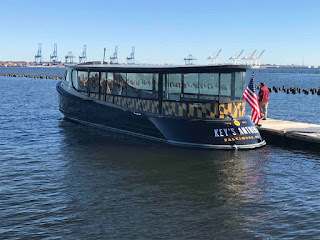 An investment group owned by Kevin Planch of Under Armour owns the Baltimore Water Taxi service ("Baltimore Water Taxi hopes to hire 25 amid expansion," Baltimore Sun); "More details on the new Water Taxi stops under Kevin Plank's ownership," Baltimore Business Journal) which focuses on serving the tourist market between the Inner Harbor, Fells Point, and Fort McHenry. Ferries a viable transportation service in port cities. Port cities like Boston, New York, San Francisco ("Bay Area ferry ridership exploding, especially in Vallejo; East Bay Times; "SF Bay ferry service on brink of major expansion," San Francisco Chronicle), and Seattle/Puget Sound ("A Seattle-to-Renton ferry? Regional leaders explore watery ways to ease traffic," Seattle Times; "Tacoma Councilmember Proposes a Fast-Ferry Service to Seattle," The Stranger) still maintain significant ferry operations, because of access constraints such as bridges as well as relatively short distances between the edge of the waterfront and central business districts and/or major destinations (such as Logan Airport in Boston). 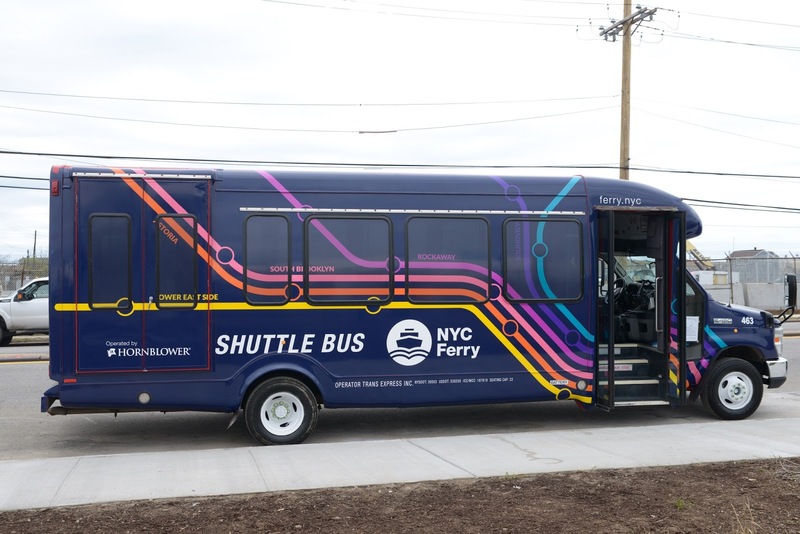 New York City has been expanding ferries, but in part it's political, because it's the only mode under the direct control of the city ("New York City's Ferry Fleet Is Off to a Fast Start" and "How the Ferry Is Changing the Brooklyn-Queens Waterfront," New York Times). Services continue to expand in the Puget Sound region also. 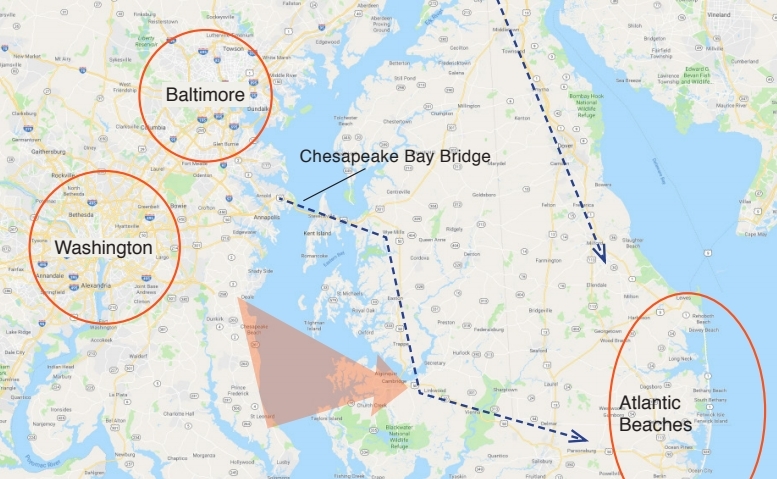 Instead of a bridge, why not start with a fast ferry from Baltimore? Modern ferries are a lot faster than the ones that were taken out of service seventy years ago. They could do a fast ferry from Rock Hall to Baltimore Harbor, with a free covered bicycle park and ride, and a paid auto park and ride. It would be a viable commute. .
A passenger ferry large enough to carry bikes would attract some bike commuters who live and work within biking distance of the ferry terminals. Bikes are free on the Cape May ferry. It would also promote tourism, for both Kent County and Baltimore. Anyone who gets off the ferry with a bike is probably planning to spend locally, not ride all the way to Ocean City. 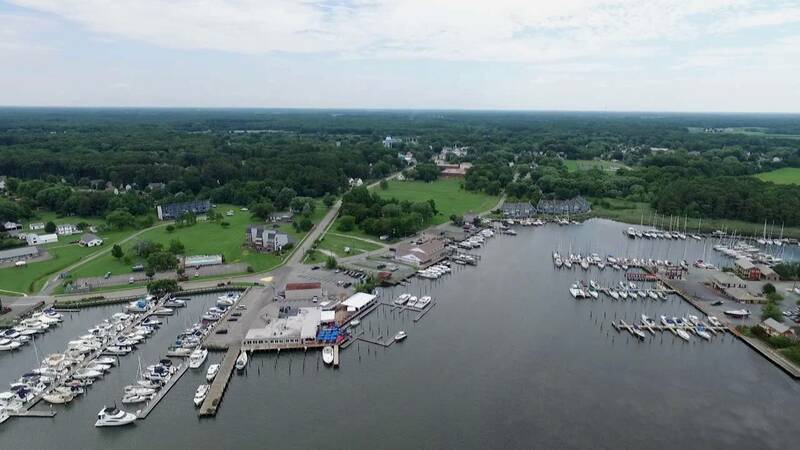 A passenger ferry, with a pricing structure that encouraged walking or riding a bike to the ferry, would not flood Kent County with automobiles. It would be more palatable than a bridge to people who oppose the traffic that a bridge would bring. It would also be advantageous speed-wise, as it would be direct, rather than crossing the bridge and driving between Annapolis and Baltimore. 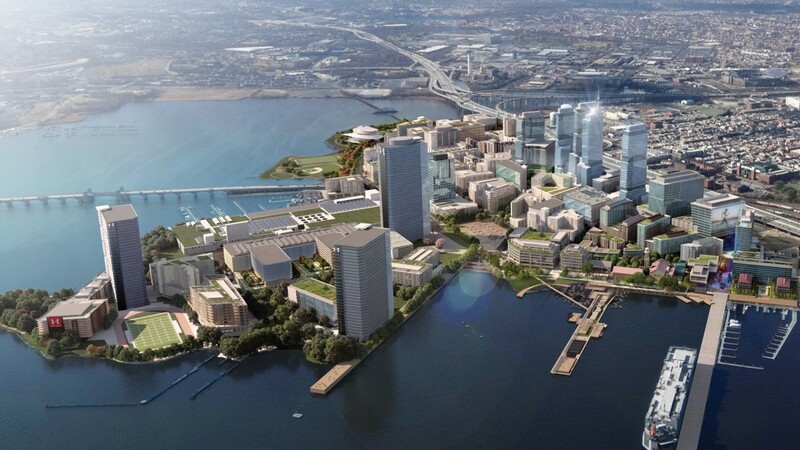 Proposed Port Covington development, Baltimore. Rock Hall ("Weekend adventure: A visitor's guide to Rock Hall and its old-school, waterfront charms," Baltimore Sun) is currently a 91 mile drive from Baltimore Inner Harbor. A ferry trip would be a little over 20 miles each way. The ferry trip would likely be much faster at rush hour. You could probably get Sagamore Development ("The Port Covington Redevelopment Project Examined," Baltimore Sun) to subsidize it--the same company owns the Baltimore Water Taxi. A second bridge would cost about $7 billion. Test car ferries too. A car ferry should be studied separately. A large car ferry would affect traffic volumes on both ends, which would limit the number of viable landing locations. You couldn't use the same pier as the Water Taxi. It would likely have to be more costly for drivers than the Bay Bridge, which would limit its usefulness outside rush hour. Note that a round trip fare between Bainbridge Island and Seattle with a car is about $24/round trip. Is the market for travelers large enough to support two bridges? Paying for a new bridge with tolls is a stretch, especially with a Governor who likes to keep the tolls low ("Maryland cuts tolls on Bay Bridge, ICC and other roadways," Washington Post). Fast ferries. 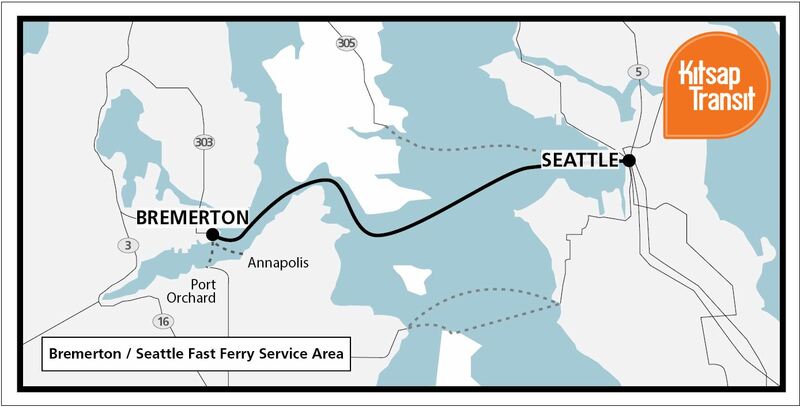 Kitsap County, Washington has introduced fast ferry service between Bremerton and Seattle. Covering a distance of about 30 miles, the trips take about one half hour and cost about $12 round trip, with discounted commuter passes available. 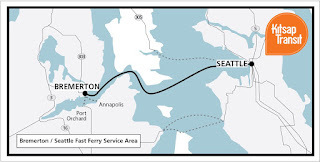 Although the program had a bunch of problems in the beginning including malfunctions and still wrestles with a poorly working reservation system ("Kitsap Transit fast ferry continues to maneuver through rough waters," Kitsap Sun), there appears to be growing demand for the service and it is stabilizing in terms of successful operations, with plans to add more vessels to meet demand and expansion. The system is funded in part by a county sales tax. The NYC Ferry shuttle bus. (DNAinfo/Katie Honan). Complementary changes to surface transit in Baltimore would be required. The "problem" with service between Baltimore and the Eastern Shore is people traveling from the pier in Baltimore to and from their final destination. Seattle has a concentrated business district that is walkable from the ferry terminal. Although other ferry services to Seattle, depending on the route, include car ferries, whereas in San Francisco, the Ferry Terminal is served by multiple streetcar and bus routes. 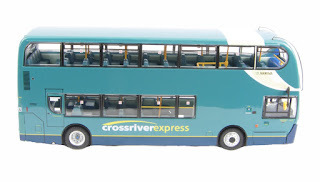 A British bus route is marketed as the Crossriver Express. A complementary bus program in Baltimore could be labeled as the Crossbay Express. 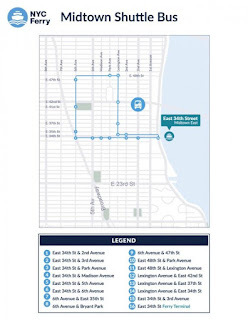 Better surface transit bus services would have to be developed to be able to make such a service work. For example the private sector New York Waterways ferry service and the public sector NYC Ferry both provide complementary shuttle bus routes to get people closer to their final destination. A fast ferry service could co-develop necessary additions in conjunction with the Baltimore Circulator service. Conclusion. 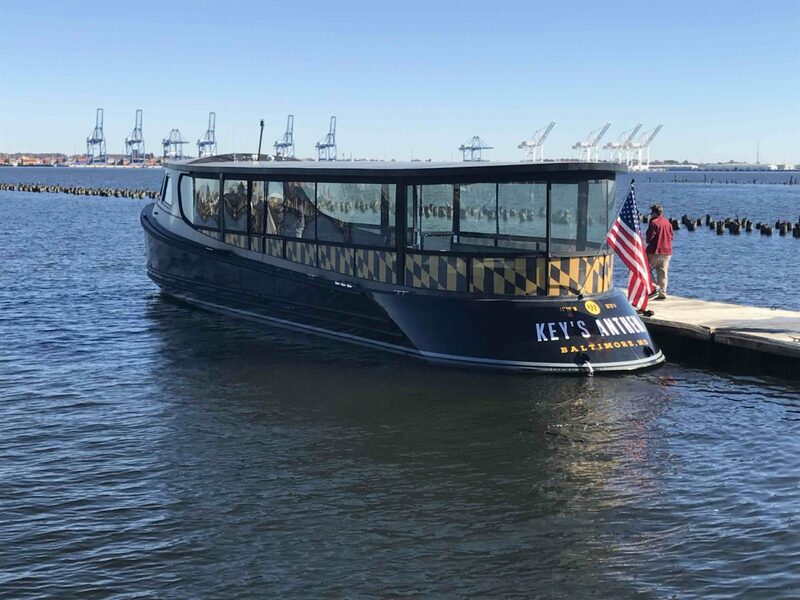 Perhaps Baltimore to the Eastern Shore, not the Potomac River, is the most viable place to test regular ferry service in the DC-Baltimore region. On issue in DC on water taxis is the city is very boring from the water. North of the Roosevelt bridge / Kennedy Center it does become a bit more interesting. David Edmondson at GGW did a map of all the historic railroads and ferries in the DC/Baltimore area, showing there used to be quite a few out of Baltimore. port cities develop from the waterfront inward. That's what happened in Georgetown. Most of the city's port function ended up on the Washington Channel. But in between the federal govt. got most of the river's borders for parks. It's great theoretically as a park asset, but not so great in terms of vibrancy and activation. Plus as I have said for years and years, the distances between the interesting places, via the river, is pretty long, especially when you add the time to get between the river and origin or destination points. I get press mailings for the Thames River Heritage Park in Groton/New London CT. I guess it's about one mile wide. But having a mix of destinations on both sides of the river and not just cultural destinations makes a big difference. 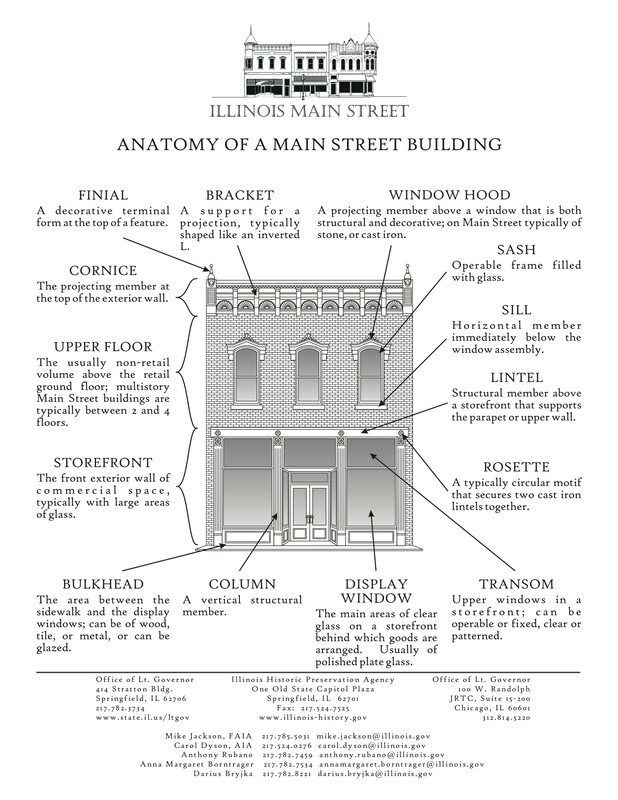 I always remember the line by the professor Alex Wall: "commerce is the engine of urbanism."" i will say that map, while quite cool and thank you for sharing!, illustrates the problem with this approach to mapping. It's an example of peak overreach I think. Too much information, too similar an iconography maybe too? But thank god for being able to use Flickr to view it. When you drill down to an area at the highest resolution, all the other information "fades away". The detail is great. Seeing the ferry line on there for Rock Hall also leads to another idea, of maybe doing a Queenstown to Rock Hall to Baltimore fast ferry. I did not know about the Maryland, Delaware and Virginia RR, among others. ... once there was a display in the science reading room at LC, and it included a Railroad Guide Atlas from the 1870s, which showed e.g., the Maryland & Pennsylvania going all the way to Lake Ontario! The Michener fiction book_Chesapeake_ avers that the elite for whatever reason did not want railroads on the Eastern Shore, and worked against their development. And for obvious reasons, you could see why the B&O would have been western and along the interior Atlantic coast focused rather than the Eastern Shore. 1. taxes and constantly cutting taxes and then complaining about debt that results from this structurally created deficit. or using that as an excuse to cut "entitlements"
4. not doing the best possible way of doing something in order to reduce expenditures. Simple stuff like converting to dollar/two dollar coins instead of dollar bills, and getting rid of pennies. Hard stuff like single payer. 7. relatedly, that the way entitlements work now isn't sustainable. interesting article from the Boston Globe about ferry commuters. It costs more but is more reliable and more pleasant.